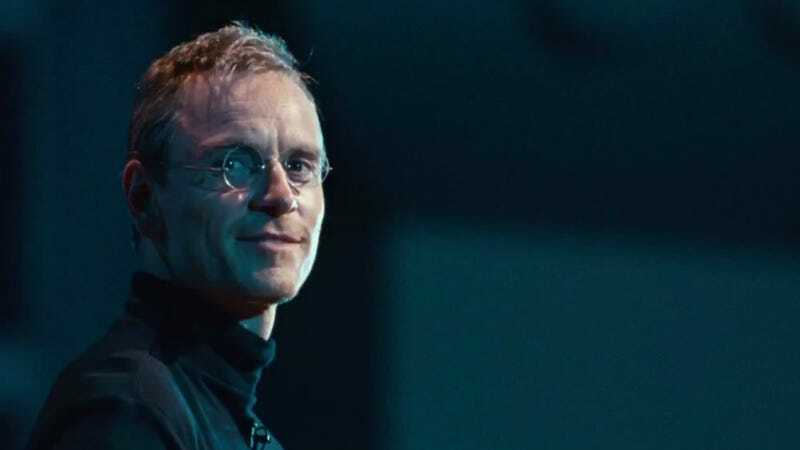 You could call Steve Jobs a filmed adaptation of a book. Or, more accurately, you could call it a filmed adaptation of a book that’s structured like a play. More simply, you could just call it a filmed play. And—if you wanted to get complicated—you could call it a film based on a book based on a man and written in the style of a play. Call it whatever you want, really, but just don’t call it a biopic—because it’s not. Steve Jobs isn’t a movie you see to learn about the man Steve Jobs, it’s a movie you see to be entertained by the character Steve Jobs. The film is broken down into three 40-minute scenes—each filmed in real-time—that chronicle what are arguably the most important keynotes of Jobs’s career: the introduction of Macintosh in 1984, the introduction of NeXt in 1988, and the introduction of iMac in 1998. Sorkin takes plenty of artistic license by using this structure, and creates a dense, walk-and-talk filled narrative path on which interactions that both did and didn’t happen in real life are acted out by a group of performers bringing their A game for a near breathless 120 minutes. Michael Fassbender, who appears in almost every shot, is expectedly tremendous (and kind of exhausting?) as Jobs, but it would be unfair to call this “his” movie. Kate Winslet is a delight as Joanna Hoffman, the head of Jobs’s marketing team and his most trusted friend. Thanks to Sorkin’s screenplay (I’m going to keep talking about him), Winslet is given her share of memorable moments, as are Jeff Daniels (as former Apple CEO John Scully) and Seth Rogen (as Woz). Whether Steve Jobs the man interacted with any of them as he does in Steve Jobs, the movie, is irrelevant, as long as you know that going in. Steve Jobs is historical fiction. Thoroughly researched historical fiction based on an authorized biography, sure, but historical fiction through and through. Did Scully and Jobs fight just minutes before the introduction of NeXt in 1988? Hell no. But Sorkin created a captivating, Dolby-ready fight scene for the movie, anyway. So. Sorkin? Give him an Oscar. Actors? Give ‘em all Golden Globe nominations. But director Danny Boyle? There’s not much to say, really. Though he’s been praised by the actors for implementing a rigorous rehearsal and shooting schedule, as an audience member you spend much of the movie wondering what he’s doing there in the first place. He appears to spend most of it on autopilot—letting Sorkin’s screenplay do all the work. And when he does make an appearance, it’s usually in the form of distracting and unnecessary flourishes, like words and images being projected in the background of scenes. But before Danny Boyle schmaltzes up the film’s conclusion with some melodramatic camerawork and a magnificently terrible music choice, Jobs’s perfect final line to his daughter reminds us of why we spent two hours here in the first place—to listen to Aaron Sorkin’s characters talk to each other. And while, by all accounts, they don’t talk anything like the people on which they’re based, I loved listening.